Back in the day this Port Melbourne Milk Bar would have seen all walks of life. Mum & dad getting the bread and milk in the mornings to the 20 cent bag of mixed lollies for the kids after school! In 2015 Adam met Lorraine at our opening night for "the Bank" Lorraine was told about our team by a girlfriend, she was the last to arrive & how excited we were to find out very soon it was the perfect fit. Les Finnis from Les Finnis Architecture complete the original design to turn "The Bar" into a home. Chris & Lorraine felt it would be fitting to continue the story including their to to transform it again. Also enlisted to collaborate was Catherine Francis from her Interior Design Company, as you can see this home is truly exceptional in a number of ways. most of all it has truly transformed the lives of Chris, Lorraine, Sienna & Aiden. In 2014, Rock City completed this unique property. With this level of detail we were not surprised. The project won so many awards. As a result of this project, Adam was nominated as a candidate for the Master Builders “2015 Young Master Builder Of The Year” which was a huge recognition of all the efforts of our team. In 2014 our team had the pleasure meeting Casey & Dan, their home in port Melbourne was quirky to say the least. With 2 little girls and addicted to the area there choices were limited,RCBG were were recommended by a previous client and were awarded the construction of the new home.Working with Alex from A & B Architecture along with Dan & Case was such a wondeful experiance for us. Adam ran into Casey the other day her quote : " I would do it all again tomorrow we had so much fun, what an experience". In the delightful Brighton precinct, the old bank has been modernised. This building contains an office space in the offices alongside Richard, this contemporary modern apartment has been a welcome addition to the heritage listed building. 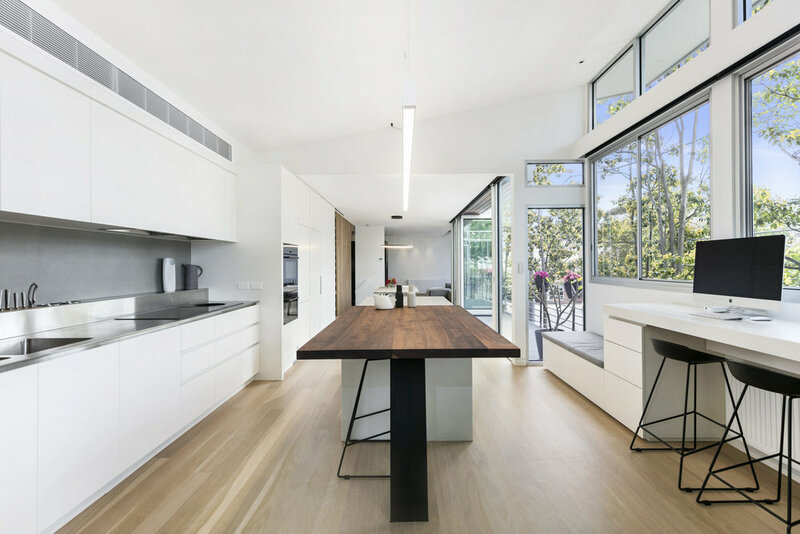 The unit is full of features, use of timber is prominent throughout the property with spotted gum ply use in majority of the joinery, the timber floor and internal cladded wall in the same solid timber. This timber is complemented with the inclusion of VM Zinc from the external elements brought internally around the fireplace with colour plate used throughout. Externally the concrete finish and VM Zinc is clean and simple which leaves the structure to stand out on its own. As you will see this without doubt an extraordinary example of what dreams can create! It’s a credit to Jackson Fitzroy-Kelly, Richard & Robyn Lingard & the RCBG Team. This has been an extremely exciting project to be involved in and is a stand out in our portfolio. We are proud and excited to “Create Dreams” this is testament to that. What would it be like to be on holiday when you are at home? Our team were excited to begin our second project with Quinn Architecture (Georgie) after the completion of our Toorak renovation we both knew the fit was perfect. Our team were engaged by Kathy & Michael to construct their new home in Elsternwick. This home is very close to our hearts at RCBG, the home to a result of all parties working in synergy together. The oppertuinity to show off the fabolous home is never missed, if you are interesed in seeing it up close pleae you let us know. With baby #2 nearly due the current living conditions were just not suitable. Being friends of our Architect Quinn Architecture, our team, clients & Georgie Quinn (Quinn Architecture) collaborated to achieve a design that fitted the brief, budget & time lines. It all happened very quickly! The brief was to open up the home to create a family space, new bathrooms, euro laundry, kitchen & study all fitted into to this quaint house of Fitzroy. What a success... Oh & baby #2 was delivered two days before handover so the timing was perfect.